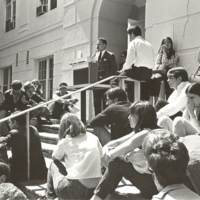 In May of 1968 AU students held a series of rallies on university governance issues. The students were concerned about the confidentiality of their records, curfews for women, mandatory housing rules, and the inclusion of the student's voice in the making of university policies. The University formed an ad-hoc conference of students, faculty and administrators to review the students demands. Eleven out of the twelve demands were eventually approved by the conference participants. 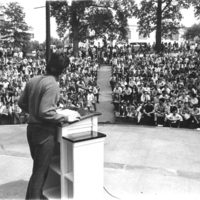 AU Junior, Jim Crouch, presented the list of student demands at the rally in the amphitheatre. 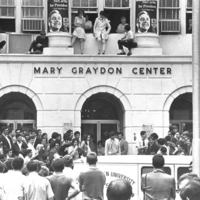 A faculty member speaks to students on the steps of the Mary Graydon Center. Students come together at the Mary Graydon Center to present their demands.